This month Dougie Vipond and the Adventure Show team are back where it all began with the OMM - the Original Mountain Marathon. 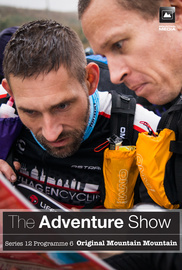 This month Dougie Vipond and the Adventure Show team are back where it all began with the OMM - the Original Mountain Marathon. Nearly half a century ago, this iconic event laid the foundations for the thriving adventure racing scene we know today. The 2016 event is as tough as it was back then, yet 1,800 competitors, from across the UK and around the world, have gathered in the Galloway hills for this two-day ultimate test of endurance, navigation and willpower. Also in this month's Adventure Show, and still on foot, we join a top endurance athlete as he attempts to set a new winter record in the Scottish mountains.